Welcome to Lufeng.Welcome to Yanshan County. Yanshan county is located in the south of Hebei Province, is one of the antiquity and young cities on the coast of Bohai Sea. The entire county has an area of 795.2 square kilometers and a population of 420 thousand, exercises control over 6 towns, 6 rural areas and 450 administration villages. Yanshan is located in the inner continental shelf of economic circle surrounding Bohai sea, and has been marked out and incorporated into city circle of“Beijing,Tianjin and Hebei”by the national Development and Reform Committee on November of 2004. Yanshan has outstanding economic feature,has formed four dominant industries as vegetable,grass, Chinese date and farming; has formed three featured industries as pipe transportation equipment mamufacture, socks and sporting equipment.It has a long history on pipe transportation equipment manufacturing production and is a famous manufacturing base all over China. Yanshan has superior location and distinguishing location advantages. Yanshan is located at Binhai Plain in the North China, is the communication center between Hebei and Shandong Province and the door connecting the south of Beijing and Tianjin, is the joint point among North East of China.North China and East China, relies on Beijing and Tianjin in the north,120 kilometres from Tianjin and 250 kilometres from Beijing;adjacent Bohai Sea at the east, 150 kilometres from the harbor of Tianjin, 40 kilometres from the Huanghua harbor,10 kilometres from the Jin Shan Highway in construction;connects Shandong in the south,150 kilometres from Jianan,the xapital of Shandong;faces Taihang in the west,260 kilometres from Shijiazhuang,the capital of Hebei;“30 minutes to the railway station,2 hours to the airport,3 hours to get into Beijing”.Jinguang,Jingjiu Trunk Railway and Jin Shan Speedway pass by in the north and south of the city,Suohuang Railway and Shihuang Speedway bestride across in the east and west.State and provincial trunk lines form the network inside the city,village assess extends in all direction and realize that every village has blacktop passed by. Yanshan is vast territory with clear and blue sky. It is the alluvial plain of Yellow River,with Zhangwei New River and Xuanhui River across into the sea.The four seasons are clearty demarcated with abundant illumination and pleasant weather,the average temperature all around the year is 12.1℃ with annuan average rainfall of 531.5mm and non-frost season of 200 days;the rate of smoke and dust discharge reaches 98% of a set standard with 269 days above II class and without water quality pollution.Yanshan is located at drainage area of Helong Harbor with an total cultivated area of 728300 mu,including alkaline land of 250000 mu,has developed the county industry and puovide abundant land resource. Yanshan has a long history and profound inside cuiture information.In 209 BC,Xu Fu,alchemist of Qin Dynasty,recruited thousands of minors of both boys and girls,all sorts of workmen,warriors in Yanshan and its surrounding area,successfully crossed the sea in the east to Japan,passed to Japan the advanced culture and production technique of Qin Dynasty,created a great miracle in China’s Foreign Culture Exchange History,therefore Yanshan has been praised as “the first area with a bigger population of returned overseas Chinese and its relatives”. Bao Xuan,an official of Han Dynasty,famous frontier fortress poet Gao Shi of Tang Dynasty,famous doctor Zhang Xichun of modern times and famous patriotic general Gaoshunxun of modern times have become the pride and glory of the Yanshan People of midern times. Yanshan has perfect infrastructure and rich resource of labor force.Over 1 billion invested in these two years to have built up reaffic network extending in all direction,economic reliable power supply network,convenient and quick communication network,with total mileage of 60000.Water supply plant project of 8000 tons is in tense construction,and the project of natural gas into city is in process of design and constructing. Yanshan has abundant labor resources,the labor force of the entire county dissociating from agriculture is over 70000,80% of whom with education above junior high school,20% of whom whth occupation skill education of electric welding,lathe processing and garnent etc.,meanwhile,there are 6000 new added labor force with education above junior high school and 1000 graduates with education of junior college and technical secondary school to be taken up each year,the abundant human resources has made Yanshan become the best choice to develop labor intensive industry. The Industry began in mid seventies of last century,has extended its industry chain on the basis of pipe piece and pipe material industry,is the result of upgrading.Up to now,it has developed for over 30 years.Since 2000,County Party Committee,according to the train of thought“Extending feature industry to large scale,strengthening large scale industry”and through enterprise innovation,capital reform,industry conformity,has made the pipe piece gradually enter into phrase of vast development, has made the main index of production value and sale revenue and tax etc. increase by 20% per year,has made pipe piece and material industry take possession of high-end market and take a solid step for participating international competition. 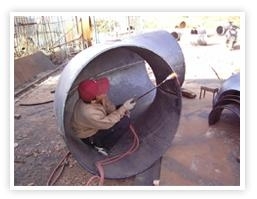 At present,the whole county in total pipe transporation equipment manufacturing enterprises of 500,including 4 enterprise with annual sale revenue over 100 million, 56 enterprises with annual sale revenue over 10 million,3 enterprise group,with total capital of 1000 million and employees of 50000. In 2004, the enterprises sold variety of series products near 600 thousand tons,gained revenue of 2.6 billion.The products has been sold to 29 province all over China and accounted for over 25% of the domestic market, and has been exported to 20 countries and rdgions such as Japan,USA, Italy, Sudan etc. Advanced Production Euqupment, Good Processing and Matching Capability. The whole county possesses vatiety of equipment of over 750 sets for manufactruring and prossing pipe transportation equipment. It possesses 216 large and medium sized press of 150-3600 tons, 313 intermediate frequency push manufacturing machine, which can process various models of angle fitting of DN25- DN2200 with annual production capacity of 280 thousand tons; possesses of intermediate frequency pipe bender which can process varies models of angle pipe of DN200- DN1400 with an annual production capacity of 180 thousand tons;possesses 8 production lines for hot rolling steel pipe and hot diameter narrowing seamless steel pipe respectively with an annual throughput of 250 thousand tons; possesses 18 screw steel pipe production line with annual throughput of 270 thousand tons DN2OO- DN3000 screw steel pipes; possesses of 360 sets of tees and flanges equipment for special purpose with an annual production capacity of 120 thousand tons. Have a variety of product category,initially take shape of a complete system. The pipe transporatation equipment of our county can be divided into 11 categories and over 1400 varieties such as angle fitting,threeway junction, cross junction, angle pipe, flange, collecting tube,reducing pipe, valve, bracing frame, compensator, vertical screw connecting sleeve etc. The pipe transportation equipment can be divided into carbon steel,alloy steel, stainless steel; can be divided into high pressure, medium pressure and low pressure pipe pieces according to pressure; can be divided into pressing manufacture,pushing manufacture and welding; dual face submerged arc welding solenoid and high frequency welding hot reducing seamless steel pipe are the twn main kind of pipe materials. The whole county has 32 pipe transportation equipment manufacturing enterprise which passed ISO9002 international quality system authentication; up to now from Year 2000,the whole county has introduced over 30 new technology and new techiniques and has developed 12 new products and has over 20 enterprises which have translated into enterprises of science and technology. The pipe transportation equipment products of our county has won 11 rewards such as the National Spark Prize,Science and Technoloty Fruit Prize,Science and Technology Advancement Reward of The Province etc.,has got 5 high quality product rewards of Hebei Province and 2 famous brand products of the province. In the 26 supplying units confirmed by national electricity corporation and national petrochemical corporation, there are 5 enterprise in Yanshan,including 2 enterprises conformed by China Electricity Head Corporation to be the fixed manufacturers for high pressure pipe pieces, 1 enterprise confirmed by National Nuclear Research Institute to be fixed manufacturer, 4 enterprises confirmed by Boiler Quality Inspection Certer of National Labor Department to be fixed manufacturer. The pipe transportation equipment of Yanshan have been comprehensively applied to the national key constrnction projects such as Qinshan Nuclear Electricity and Beijing Nuclear Test fast reactor etc. In the 6 enterprises that has won the bid for main pipe line transporting the gas from the west to the east, there are 2 enterprises in Yanshan. The pipe transportation equipment products of our county has won 11 rewards such as the National Spark Prize.Science and Technology Fruit Prize, Science and Techonology Advancement Reward of The Province etc. has got 3 high quality product rewards of Hebei Province and 2 famous brand products of the provice.The whole county has got national patents for 19 products. Company Name : Hebei Lufeng Piping Equipment Co., Ltd.